Legal news for Maryland work-related firefighter death attorneys – One firefighter and two residents injured in nursing home fire. Adelphi, MD (NewYorkInjuryNews.com) – Firefighters were called to the scene of a Beltsville nursing home blaze in Adelphi where three people were injured, Tuesday evening, February 16, 2010, as reported by ABC 7 News. Firefighters rushed to the scene of the blaze at Paint Branch Nursing home on Powder Mill Road. Fire officials reported that the blaze had begun shortly before 9 p.m. As firefighter’s battled the blaze, which was predominantly on the porch, intense heat and black smoke surrounded the home. Two of the nursing home residents sustained injuries or became ill from the fire. 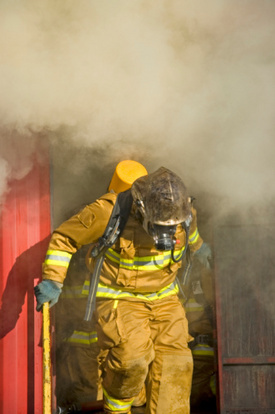 One of the firefighters combating the flames also suffered from minor injuries. It was not reported if the three injured were transported to a hospital or treated at the scene. Injuries were not specified. The fire was brought under control in 15 minutes by Prince Georges and Montgomery Counties Fire Departments. Fire investigators continue to try to determine what caused the fire in the first place. It was reported that the structure was originally built as a farmhouse and later converted to a nursing home facility. After the blaze was brought under control, 19 residents were still removed from the facility due to the intense lingering heat. The investigation continues.